I write on Martin Luther King Jr. Day and the day of our President’s second inauguration. Many synchronicities stir me as I consider this time January 21,2013 and what it means to me. In his speech, fifty years ago, Dr. Martin Luther King reminded us of the power of “having a dream”….that is, “thinking outside the box” and allowing a new paradigm to inform and evolve the human condition. As we stand on the brink of another awakening and allow that same kind of motion to inform our choices, I recognize the desire to be healthy and the local food movement as a common motivator for change on many levels. The degradation of our soils and waters as well as the false advertising that allowed our American Diet to become imbalanced, plus the grace we now have to study scientific evidence and do research on the internet, allows the common man to pursue the truth about what is healthy and what is not. Mis-information seen in advertising campaigns and the desire to be self-reliant in the pursuit of heath and balance all contribute to a Food Revolution. Young parents are finding new answers for the food allergies and sensitivities they see in their children, baby boomers are discovering that longevity is built on the basics of good nutrition. Friends with cancer are healing themselves through alkalizing their diets. Our customers teach us how strong this desire to know and understand and eat correctly really is. This Food Revolution is coming out of inquiry about “how we got here.” It questions authority and human ignorance and helps people have the courage to make new choices. 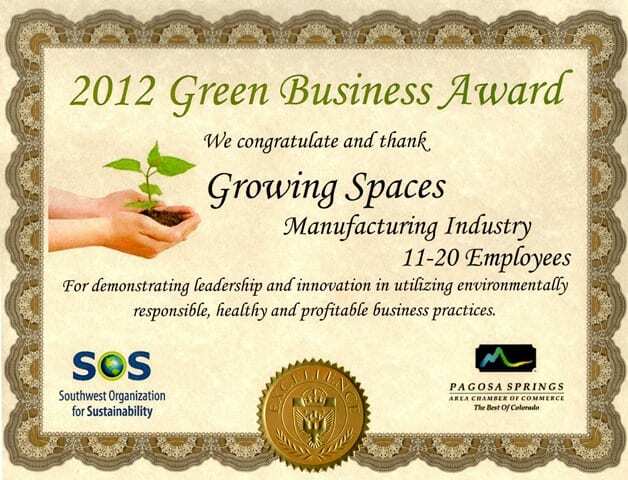 On January 19th Growing Spaces was privileged to be awarded the “Green Business of the Year” by the Pagosa Springs Area Chamber of Commerce and the Southwest Organization for Sustainability. We stood among many other businesses in our small community who demonstrate the need to do things differently. This honor came out of our goal last year to expand our focus on education to describe the LIFESTYLE THAT INCLUDES a Growing Dome. Udgar and I have lived that lifestyle now since the late seventies. But even in the fifties, Alan Watts said, “We don’t come into this world at all. We come OUT of it,” meaning that Nature is our base, our foundation, and the reverence for Nature should be our common ground. When I was twelve years old, I was fascinated by the same message from Albert Sweitzer. Today, at 66, I “have a dream” that the preventative medicine of sound nutrition will drive a renaissance for organic growing and regeneration of our soils and waters. I dream that my own legacy to our kids and grandkids will be a platform of health built upon the reality that “everything is connected and we all live downstream” to quote our friends at Bioneers. Misinformation must be replaced by truth. The truth of our experience and the discipline of finding ways to live a healthy lifestyle don’t have to become an obsession or ego-trip. We can JOIN in the flavors and delights of real food, as farmers, consumers and gardeners once again. Until recently (around seventy years ago) EVERYONE ate fresh organic food. My dream for this day is that 2013 will be a new beginning in my own personal commitment to health and wholeness and that many others will join me this year in making new choices. More aliveness will be the result, and a better quality of life, shared with more folks, who may help to drive new legislation and new awareness about what is real and good about living.